The failure of any hen harriers to nest successfully in England in 2013 led the RSPB to call for a concerted plan of action. We have consistently supported the development of an effective Hen Harrier Action Plan that will lead to the recovery of the hen harrier population across suitable habitat in England. We have been working with the Hen Harrier Sub-group of Defra’s Upland Stakeholder Forum to develop an agreed Hen Harrier Action Plan and have set out our position publicly through, for example, this blog (I, ii). We support Actions 1-4 in the draft Plan (monitoring populations, diversionary feeding, analysing monitoring information and building the intelligence picture, and nest and winter roost protection) and are supporting the delivery of some of the elements of the plan through our new LIFE+ project (iii). 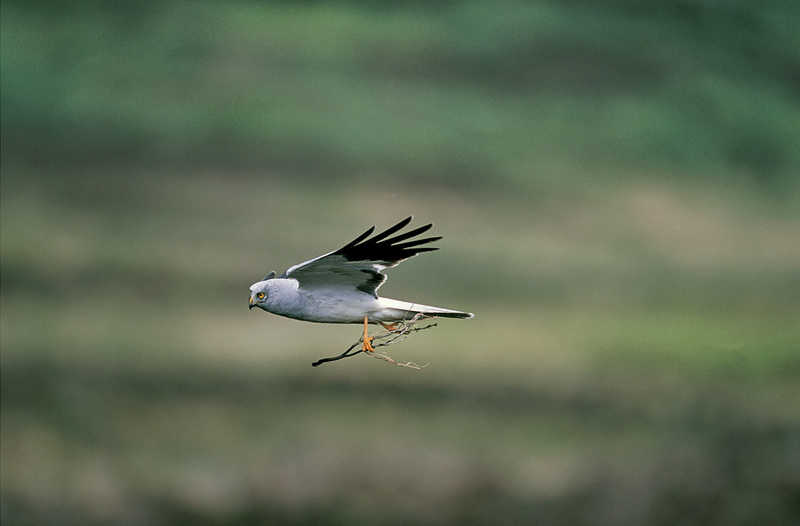 The RSPB is investing £900k into harrier recovery measures to deliver the public benefit. We think Action 5, lowland reintroduction, needs to be fully assessed against IUCN guidelines and statutory requirements, and we do not believe it is an appropriate action in the short term. The RSPB does not currently support Action 6, so-called brood management, and our reasoning and concerns are set out below. We are convinced that work should start now on the bulk of the plan and that brood management should be subject to further consideration and wider consultation. Brood management involves removing hen harrier broods from driven grouse moors once breeding numbers have reached a density beyond which they would expect to impact significantly on numbers of red grouse for shooting. The RSPB believes brood management may merit experimental investigation in the future, but only once hen harrier numbers have recovered to a pre-agreed level and less interventionist approaches, particularly diversionary feeding, have been widely attempted. We know that hen harrier numbers would recover naturally in absence of illegal persecution (iv). So we believe our attempts to work with the grouse shooting community to develop a new toolkit to manage the conflict between the hen harrier and red grouse is a positive approach, with brood management as an option for the future, is a positive approach. 1. What legal mechanism is being considered to allow for the licensing of brood management under the provisions of the EU Birds Directive? 2. Under the Habitats Regulations, why has an appropriate assessment of brood management not been required given that it is likely to operate in Special Protection Areas for which the hen harrier is a qualifying feature? 3. If the scheme is deemed legal, why don’t we wait until some recovery of the population, at least until it reaches a point where it causes national economic concerns to grouse moors and where alternative solutions are deemed impracticable, before introducing a trial of brood management? 4. With disease control leading to increasing red grouse abundance and cessation of population cycles, how will we know when the time is right to impose a brood management scheme, i.e. how will we establish whether the problem is serious given that the current model for assessing impact was developed some years ago (v)? 5. With regional variation in grouse productivity and survival, how will the model for assessing the impact of hen harrier predation be used at different temporal and spatial scales? 6. Why won’t there be a requirement for diversionary feeding to be widely attempted before a brood management trial is introduced? 7. Why hasn’t Defra considered lump sum compensation to estate owners and workers where harrier numbers reach levels which make management for grouse shooting un-profitable, seeing this as a payment for the production of a public good? 8. How many harriers will be housed in aviaries as the scheme develops and what is the preferred ratio of natural and housed broods to secure delivery along the population growth trajectory suggested in the draft Action Plan? 9. How many hen harriers will be tolerated in the wild under a brood management scheme and what happens if that threshold is passed? 10. Who will be legally responsible for the harriers in captivity and what will happen in the event of wild harriers becoming ill or dying in captivity? 11. When will a decision be taken to progress with brood management in an area during the nesting period and who will make it? 12. Where will the aviaries be located to house chicks and what specifications will they need to meet? 13. Who will provide training for those licensed to keep the birds in captivity and how will they be recruited? 14. Who decides which nests go into captivity (and which don’t) and will there be an appeal process if an estate believes it is being penalised for carrying a brood(s) not taken into captivity? 15. Under what form of regulation will an appeal process take place, who will undertake the appeal and how long would it last? 16. What happens to the remaining adults (and their broods) on the moors if they lay a replacement clutch or they move to an adjacent estate and lay a clutch? 17. What happens to the scheme in the event of an illegal persecution event on any one of the participating estates? 18. What happens when fledglings are released back to their natal moor, or return there from alternative release sites, and cause disturbance to grouse shoots? 19. How will the scheme help to tackle the persecution of other raptors which are being restricted to settle in the uplands by criminal acts? 20. What level of public support is there for brood management? 21. If a scheme is permitted, would Defra consider a scheme for other threatened species that pose an economic disadvantage to individual landowners? 22. What would happen if the recovery trajectory is not being followed and brood management does not secure the recovery demanded? 23. How much could a full brood management scheme cost (given that the English population could reach c.340 pairs (vi) to operate and who will be responsible for paying? 24. How much is the state prepared to contribute to a brood management scheme? 25. Who will administer, regulate and monitor the scheme and how will this element be funded? Despite brood management not being necessary for hen harrier recovery, shooting organisations have asked for a trial of brood management to begin immediately to manage a perceived threat to individual estates. This has been characterised as a necessary condition to gain buy-in by individual estates ahead of any meaningful recovery of the hen harrier population. We reject this analysis given the current ebb to which the English hen harrier population has been reduced, recovery is a prerequisite for brood management. The current brood management proposals are based on system used in France and Spain to manage impact of harvesting on nesting Montagu’s harriers. In these cases, the key threat is nest destruction during harvest (a legal agricultural operation) rather than illegal persecution. The capacity of similar proposals to address the key factor preventing population recovery for hen harriers - which is illegal persecution - may be limited. Calls for immediate publication of the Action Plan, which has yet to be agreed, have also been made by some Sub-group members. We have received criticism from some that we have been ‘holding up’ the process yet we believe our concerns are entirely valid and in the public interest to be answered. We support publication and implementation of a joint Action Plan that adopts Actions 1-4 and investigates Action 5 more rigorously to identify how a suitable lowland reintroduction could be delivered. However, we believe the proposal for a controversial trial of brood management should be discussed in public at this stage and we will not support Action 6. We have suggested that Defra publishes a) the agreed and workable elements of the Hen Harrier Action Plan and b) the contentious brood management element of the plan as a discussion document to allow the public to challenge the proposals before it goes any further. We believe this is a reasonable approach. iv Etheridge et al. 1997. Journal of Applied Ecology 34: 1081-1105.
v Fielding et al. 2010. A conservation framework for hen harriers in the UK. JNCC Report 441.
vii Fielding et al. 2010. A conservation framework for hen harriers in the UK. JNCC Report 441. Andrew - that's not much of an answer is it? Something similar was once done somewhere else! If that is the level through which GWCT and the shooting community have thought your 'solution' to the conservation problems of Hen Harriers then it doesn't surprise any of us that the talks appear to be at an impasse. 1. do you know which estates are killing Hen Harriers illegally? 2. have the criminal elements within grouse shooting signed up to your plan? If the answer to either question is 'no' then even if your plan might be acceptable to nature conservationists (which it clearly isn't for a host of good reasons) it isn't accepted by the people who matter in the shooting community in order for change to occur - the criminals. So, Andrew, do you know that you are speaking for the criminals or not? Andrew, brood management is a costly approach, which is justified in the case example of spoon-billed sandpipers as there is no satisfactory alternative to prevent extinction. There is a proven, more cost-effective and less interventionist technique available for managing the hen harrier/red grouse conflict, which is diversionary feeding. There have been next to no efforts to attempt this technique in England and this is the next logical step to follow. It's a bit like saying that reintroduction or translocation works so we should use it for every conservation problem. This should always be seen as a last resort when other measures have been trialled and when the cause of the decline has been addressed. Andrew - it's good to hear from you. To avoid confusion, GWCT is promoting hen 'brood management' as a way of limiting the number of hen harriers on grouse moors, because hen harriers eat grouse and might frighten off the grouse before your members can shoot them, correct? As such, you are being disingenuous by implying that your motives are hen harrier conservation. Free from harassment, hen harriers are quite capable of raising their own broods, without the need for someone to take their chicks into captivity. With only four pairs of hen harriers in England during 2014, how on earth could they disrupt your member's ability to kill grouse? And why does the GWCT not wish the public to be consulted on 'brood management'? Steve - thank you for pointing out the GWCT comments here gamewildlife.blogspot.co.uk/.../hen-harrier-recovery-plan-rspbs-fears.html One more comment for you; brood management would not be run by gamekeepers. Martin - conservationists around the world have used brood management to recover bird of prey numbers. The RSPB have been using brood management for years. Why are the RSPB now expressing so many worries about a proven conservation technique that could help to increase the number of hen harriers in England?